Cross the first wooden bridge on the right and also cross the next wooden bridge on the right. Enter the linking bubble that has the icy landscape projected on the inner side. Take the stone tablet from the pedestal, called the Slate. Notice that the upper corner of the Slate appears at the bottom of your screen while you are carrying it. About the Slate: sometimes it happens that a Bahro doesn't recognize a drawing you made although it looks perfect. In that case a Bahro picks up the Slate, looks at it and nothing happens. In that case just pick up the Slate and give it another try. If you want to change a drawing you made or if you want to delete a drawing on the Slate, click on the upper left sign on the Slate with the two strokes. By clicking on that sign a drawing on the Slate will be erased. 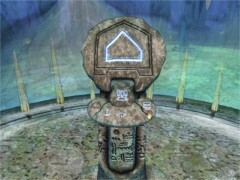 Press the blue-lit sign at the left side of the pedestal to get linked to Taghira. Turn around to see Esher waiting for you. Exit the bubble to hear what he has to tell you. Remember Esher tells you that you can use the Slate to interact with the inhabitants of the ages, called Bahro. Go forward one step. Notice the drawing on the ground. 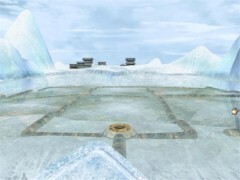 Go forward two times and notice that some ice blocks your path. Turn around and go one step forward. Turn to the right and go one step forward. Listen to how the ice is now cracking beneath your feet. Drop the Slate at that spot. Notice that a crack appears in the ground. When a Bahro picks up the Slate the crack grows even bigger. Turn around and enter the linking bubble. Take the Slate from the pedestal that the Bahro has returned. Head back to the crack in the ground. Turn to the left and go forward one step. Because of the weight of yourself and the Slate the ground will collapse. Turn to the right and exit the cave. Go forward and try to climb up the ladder. The Slate is far too heavy to climb up the ladder. So... simply drop the Slate on the ground. Climb up the ladder. Go forward and a Bahro will take the Slate back to the linking bubble once more. Return to the ladder. Turn to the left to see two important things. 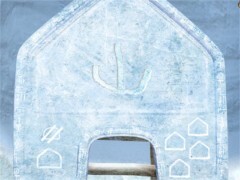 Notice the blue-lit symbol on the icy wall. Make a drawing of this symbol because you are going to need it later. It is the Bahro symbol for heat. Also notice the stone pedestal. Go forward and turn to the left to study the pedestal. Notice the image on top of the pedestal. It looks a little like an anchor. Remember this sign!. Beneath it there is some kind of triangle sign. Press this triangle shaped sign to return to the linking bubble. Take the Slate and walk back to the ladder. Before dropping the Slate on the ground use it to draw the sign of the anchor on it. Than drop the Slate on the ground. Climb up the ladder and go one step forward. Turn around and see how a Bahro places the Slate on the appropriate pedestal. Walk to the pedestal. Take the Slate from the pedestal. Now cross the icy bridge. Keep on going straight forward until you reach the brown stairs leading up to some sort of hut. Notice the stone pedestal at the right side of the stone stairs. Place the Slate on the pedestal. Climb up the stairs to have another meeting with Esher. Enter the hut and find a diagram on the wall. Later on you'll find out that this is a schedule about steaming pipes. Exit the hut. Go down the stairs two steps. Turn to the left and see a valve. Move it to the right position. Turn around. Go down the stairs and look around to notice that six buildings that are tower shaped surround the hut. Each and every tower has the same valve. Go and move the valve of each and every tower to the right position. Near one of the buildings you'll have another meeting with Esher. Return to the hut. Take the Slate from the pedestal. Turn to the right once and walk straight forward. Keep going until you reach the frozen lake with tubes in it just like you saw on the diagram back in the hut. Make sure to stand in the middle in front of the frozen lake. Use the Slate to make a drawing of the heat symbol. Drop the Slate on the ground. Turn around and go two steps forward. A Bahro will pick up the Slate and will heat the place but only for a while. So be quick now! Turn around and go forward two steps. Turn to the left and hurry to the base of the huge heating pipe. You'll see three levers with blue dots. Move the left lever to the right, the center lever to the left and the right lever to the left. Note: be aware that it can be a little bit difficult to move the levers. The best way is moving your cursor to the round base of the levers and than move them to the correct direction. Turn around and hurry to the base of the pipe at the opposite site. Notice the same kind of levers with orange dots. Move the left lever to the left, the center lever to the right and the right lever to the left. You must accomplish this before the heating time is over!!! Return to the frozen lake and wait until heating time is finished. Return to the pedestal in front of the hut. Remember the sign on top of the pedestal. 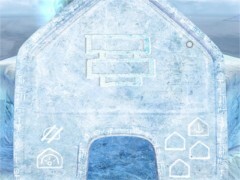 Press the triangle shaped symbol on the pedestal to return to the linking bubble. Take the Slate from the pedestal. Press the sign next to the anchor sign, the one that corresponds with the sign you just saw on top of the pedestal in front of the hut. Turn to the right and walk straight forward to the frozen lake. Use the Slate and click on the image of heat at the left side on the Slate. Drop the Slate on the ground once more. Turn around and go two steps forwards. Use the path on the frozen lake to walk to the opposite side. Go forward to have another meeting with Esher. Walk to the linking bubble called The Keep. When you approach it, it will back off as Esher told you. 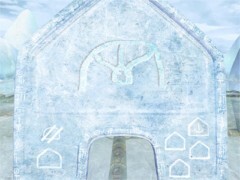 Make a note of the symbol on the pedestal inside The Keep. Turn around and walk to the pedestal at your right side. Press the triangle shaped sign to return to the linking bubble where you started. Use the Slate to draw the Keep's symbol. Drop it on the ground. Exit the bubble and go forward. Turn around to see a Bahro picking up the Slate. Enter the bubble and press the Keep's symbol on the right side of the pedestal. You'll have another meeting with Esher. Enter The Keep and press the blue-lit Slate to release one of the arms that is holding the Tablet. Press the triangle shaped sign to return to Taghira. Press the symbol on the center part of the pedestal to return to Direbo.